Many of us will seek chiropractic therapy for our dog once symptoms first appear. However, regular chiropractic care before problems develop is equally important. As an analogy just think how the tyres on your car wear improperly if the wheels are misaligned – the same problems apply to your dog’s spine. Such wear and tear of the spine is called osteoarthritis. Research shows that spinal manipulation may slow progressive degenerative changes that occur as the dog ages. So in addition to a healthy diet and regular exercise, chiropractic therapy can reduce the advancement of osteoarthritic disorders. 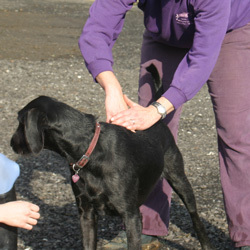 Canine chiropractic makes great sense, as treatments help to thwart impending musculoskeletal ailments, slow the degenerative processes and improve health and well-being. Studies and clinical trials by mainstream medical researchers support the health benefits of spinal manipulation and canine chiropractic care is becoming increasingly popular.